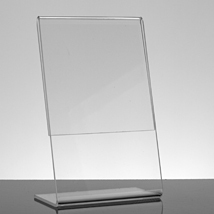 Our top quality acrylic sign holders display your signs neatly throughout the store. Great for specials, price cards and promotional and sale information. Available in either vertical bottom loading or slanted easel styles.